We spent the weekend trying not to freak out that we're driving across the country and back again. The Legacy has been detailed inside and out, both professionally and with Austin touching up every blemish or imperfection he could. We'll give her a final wash in MN right before we set her up with her new owners. I'm also nervous about leaving Stinky alone though my worrying won't come close to the trauma he'd go through if we boarded him. We picked up an automatic feeder that Austin programmed to administer a set amount twice daily at kitty breakfast and dinner times. It's going right now and working great. 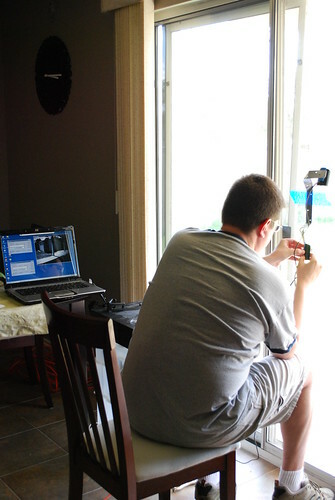 Austin has also spent a large chunk of today setting up two web cams so we (me!) can get visual confirmation that Stinky is doing fine, not trashing the place or partying too much. Luckily we had three web cams on hand because that's how my man operates :-) Here's a picture of him at work, it was just such a typical Austin moment I couldn't resist taking a photo.